The sum of CO2, HCO3-, and CO32- is called dissolved inorganic carbon (DIC). Ninety-one percent of DIC is in the form of HCO3-, 8 percent in CO32-, and 1 percent in CO2. Only CO2 can exchange with the atmosphere. At large scale, it is now well established that the ocean takes up CO2 mostly in temperate and high latitudes, whereas the ocean outgases CO2 generally in the tropics (thick full line, Figure 12.1). The air-sea CO2 flux distribution is controlled by CO2 solubility and by biological and physical processes. CO2 is more soluble in cold than in warm water. When water is heated, CO2 is outgassed to the atmosphere. This process occurs mostly in equatorial regions, where upwelling brings cold water from the deep ocean into contact with the atmosphere (dashed line, Figure 12.1). Conversely, the solubility effect creates CO2 uptake at mid-latitudes, where currents transport warm surface waters from the low latitudes. Most of the intermediate and deep waters of the ocean were last in contact with the atmosphere at high latitudes. Thus, CO2 at depth has equilibrated with the atmosphere at cold temperatures, which creates a concentration of carbon 5 percent higher at depth than at the surface (Murnane et al. 1999). This process is called the solubility pump. Figure 12.1. Sea-air CO2 flux by latitude band (PgC degree"1 y-1). Negative values indicate a flux from the atmosphere to the ocean. The total CO2 flux was estimated by Takahashi et al. (2002) based on ocean pCO2 observations. The contribution of the biological export production was estimated using SeaWiFS chlorophyll observations averaged over 1997—2001, Behrenfeld and Falkowski's (1997) primary production, and Laws et al. 's (2000) ef-ratio. The contribution of the heat flux was estimated using NCEP heat fluxes averaged over 1985-1995 with the formulation of Murnane et al. (1999). The biology and heat contributions were smoothed with a 5° running mean corresponding to the grid used by Takahashi et al. (2002). 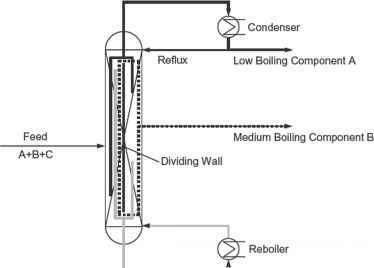 Contributions from the biology and heat flux assume an infinite gas exchange. The residual flux is estimated from the total minus the biological and heat contributions. It represents ocean transport and anthropogenic uptake as well as the error associated with the other estimates. dead tissues either remain in the water as dissolved organic carbon (DOC), which is transported by currents, or aggregate into particulate organic carbon (POC), which sinks and entrains carbon as it falls (dotted line, Figure 12.1). DOC and POC are remineralized back to DIC by living organisms and ultraviolet degradation. Sinking POC and DOC create a flux of carbon from the surface to the deep ocean, where it is isolated from the atmosphere for decades to centuries. The one-way flux of carbon from surface to depth is called export production. Deepwaters, rich in carbon, are transported back to the surface by physical processes (currents and mixing). The entire cycle of carbon consisting of export production balanced by physical transport is called the biological pump. Some plankton species grow shells of calcium carbonate (CaCO^), which alter the carbon chemistry of surface waters. When CaCO^ shells sink to the deep ocean, the surface concentration of CO^2- decreases, which drives the equilibrium reaction in equation 1 toward the left and releases CO2, thus having the opposite effect on CO2 from the biological pump. This is called the biological counterpump (or carbonate pump). Only about 10 percent of the export production, however, is associated with CaCO^ production, and the overall effect of the two biological pumps is to increase the concentration of carbon at depth by 10 percent compared with the surface ocean (Murnane et al. 1999). Plankton growth is limited by the availability of light, nutrients, and by grazing. Unlike the case for terrestrial plants, high CO2 does not enhance plankton growth, because carbon is already abundant in the ocean. Nutrients are abundant in the intermediate and deep ocean, but they are depleted over most of the ocean surface, where growth takes place. The Southern Ocean and the North and Equatorial Pacific Oceans, however, have high nutrients but low biological productivity. They are called high-nutrient, low-chlorophyll (HNLC) regions. Their low productivity is generally explained by the low availability of iron (Bakker, Chapter 26, this volume). Iron is needed by phy-toplankton for chlorophyll synthesis and nitrate reduction. The absence of iron thus limits productivity. In situ experiments in HNLC regions have shown that fertilizing the ocean with iron can enhance marine productivity. The actual impact on export production and the persistence of the potential CO2 sink, however, are uncertain (Bakker, Chapter 26). The partial pressure of CO2 in seawater (pCO2) and CO2 fluxes vary regionally and globally when sea surface temperature (SST), biological export production, or ocean circulation varies. Thanks to numerous oceanographic cruises conducted since the1960s, the seasonal variations are now relatively well established at regional and global scales (see a synthesis in Takahashi et al. 2002). Figure 12.2 presents an example of in situ observations made in the South Indian Ocean in January and August 2000. The large seasonal variations of pCO2 are mostly controlled by temperature in the subtropics, but by biological production and winter mixing at high latitudes (<50°S), leading to opposite seasonality in these two regions. Interannual variability of pCO2 and air-sea CO2 fluxes is not so well known at the global scale. A one-degree warming causes a 4 percent increase in ocean pCO2. Year-to-year variations in global SST measured by satellite are on the order of ±0.25°C, potentially driving CO2 fluxes of ±0.8 PgC y-1. Climate models forced by different scenarios predict that surface temperature will warm by 1.4° to 5.8°C in the next century, thus reducing the uptake capacity of the ocean. Figure 12.2. Meridional distribution of ocean fCO2 measured in January 2000 (solid line) and August 2000 (dashed line) in the southwestern Indian Ocean (OISO cruises). fCO2 is the pCO2 corrected for the non-ideal behavior of CO2 as a gas. The seasonal amplitude of fCO2 in the Southern Ocean, south of the Polar Front (50°S), is not as high as in the subtropics and frontal zone but is large enough to move from a summer CO2 sink to a winter CO2 source (Metzl et al. 2001). These data highlight the meso-scale variability (highs and lows on 1- to 10-km scale) in the frontal zone (40-45°S) when primary production is enhanced during austral summer. sell et al. (2000) showed that the acidification of the ocean from elevated CO2 concentration hinders the formation of CaCO^ shells by phytoplankton, which has two effects: it alters carbon chemistry and increases surface CO2 uptake, but reduces the export capacity of POC because CaCO^ shells are associated with high export production (Klaas and Archer 2002). These effects have begun to be included in global carbon models (Bopp et al. 2001; Boyd and Doney 2002), but there is a long way to go before it is possible to rely on such model results. The impact of changes in ocean circulation is also very difficult to estimate, because of the lack of large-scale observations. We rely mostly on ocean models to estimate this term. Much of the mixing in the ocean occurs on space scales of 1 meter (m) to 10 kilometers (km), one order of magnitude smaller than the resolution of current global carbon models. Upwelling is driven by wind divergence. Winds can now be measured from satellites, but the uncertainties in the estimates and in the upwelling produced by models are large. Coastal upwelling is also poorly resolved in global models. Ice melting induces ocean stratification and would also have impacts on the CO2 flux. All these effects can be estimated with current ocean models, but the reliability of these estimates is debatable. Heat content observations show that models can reproduce trends in observed climate but not its natural variability (Levitus et al. 2001; Bopp et al. 2002). The impact of changes in circulation on CO2 fluxes depends on the timescale of interest. For interannual variability, a reduction in the rate of exposure of intermediate waters, either from stratification or reduced upwelling, would cause a CO2 flux anomaly from the atmosphere to the ocean, because intermediate waters are richer in DIC than surface waters. Over longer timescales, we must consider the impact of changes in circulation on anthropogenic CO2 as well. Anthropogenic CO2 uptake would be reduced if the ocean stratifies, opposite to the effect for natural DIC. The net effect depends on the size and duration of the changes and can be estimated most reliably with a model (for model estimates, see Greenblatt and Sarmiento, Chapter 13, this volume). When atmospheric CO2 increases, it is absorbed by the oceans at a rate that depends on the rate of increase of atmospheric CO2, compared with the rate of ocean mixing. It takes only about one year for the surface ocean to equilibrate with the atmosphere, but it takes a few years to a few centuries to mix the surface ocean with intermediate and deepwaters. As a result, the storage of anthropogenic carbon in the ocean currently reaches only ~15 percent of its potential maximum (Figure 12.3). The oceans have the potential to absorb 70—85 percent of the anthropogenic CO2, but this will take several centuries after the emissions occur (Archer et al. 1997). Figure 12.3. Global mean current inventory (solid line) and potential maximum (dashed line) of anthropogenic carbon for an atmospheric CO2 concentration of 368 ppm. 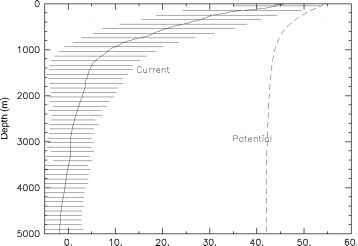 The difference between the two curves is caused by the long mixing time of the ocean. The current storage is calculated using an average of anthropogenic DIC estimates around the globe. Horizontal lines represent one standard deviation. The analysis of observations was provided by R. M. Key based on data referenced in Sabine et al. (1999, 2002) and Lee et al. (2003). exchange with the atmosphere. This effect is large and easily predictable (Greenblatt and Sarmiento, Chapter 13). The global uptake of carbon by the oceans can be estimated using several independent methods: atmospheric measurements of CO2, augmented with 813C, O2/N2, or the spatial distribution of atmospheric CO2; direct measurements of ocean carbon, surface 813C, or related tracers in the ocean; inversion of ocean tracers; and global ocean models. Recent estimates of uptake range between 1.5 and 2.8 PgC y-1 for 1980— 2000, representing one-quarter to one-half of the annual fossil-fuel emissions (Table 12.1). For the entire industrial period until 1994, the total uptake of carbon is estimated to be 111 ± 13 PgC, based on observations (Lee et al. 2003), or about one-quarter of the total anthropogenic emissions (fossil fuel plus land use; House et al. 2002). Model results are in the range of the observations. bCalculations updated by Prentice et al. (2001) based on the cited references. however, that the ocean O2 flux is zero over several years, which would not be the case if the oceans were getting warmer. Budgets based on O2 must be corrected to account for ocean O2 fluxes. 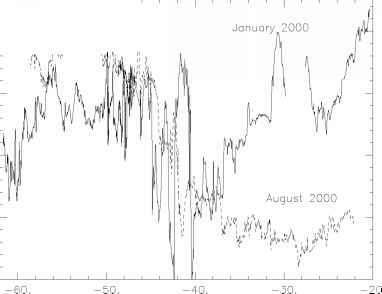 We can estimate this correction by assuming that O2 and heat fluxes are proportional and using heat flux estimates. Keeling and Garcia (2002) estimated a proportionality factor of 4.9 nanomoles per joule (nmol/J), from geochemical observations, whereas Bopp et al. (2002) and Plattner et al. (2002) estimated values higher by ~20 percent from model results. 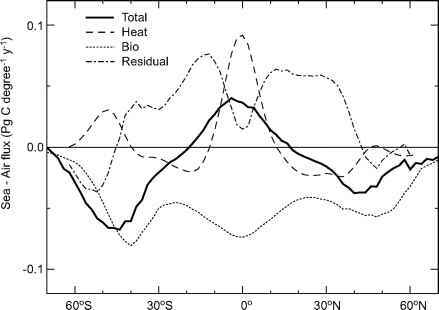 The ocean heat content was directly estimated based on millions of temperature profiles for 1950-1996 (Levitus et al. 2000). For the 1980s, the ocean heat content decreased by 0.13 X 1022 J y-1; for 1990-1996, it increased by 1.0 x 1022 J y-1. The compilation of heat content measurements has not been made beyond 1996.
Corrections to the carbon budget for the 1990s depend a lot on the assumed changes in heat content for 1996-2000. Combining temperature and sea surface height observations, Le Quere et al. (2003) estimated that the ocean heat content increased by 0.55 X 1022 J y-1, on average, over the 1990s. For comparison, Plattner et al. (2002) assumed that the rate of 1.24 X1022 J y-1 observed during 1990-1995 was maintained throughout the 1990s, whereas Keeling and Garcia (2002) used a rate of 0.6 X 1022 J y-1, based on model results including anthropogenic forcing but no natural variability. Bopp et al. (2002) did their budget only through 1996. The ocean CO2 sink based on O2/N2 corrected with observational-based heat content is 1.8 ± 0.8 and 1.9 ± 0.7 PgC y-1 for the 1980s and 1990s, respectively (Le Quere et al. 2003). It is much more difficult to estimate the regional fluxes of CO2 than the global uptake (Colorplate 9 from Gloor et al. 2003). Atmospheric CO2 measurements have small east-west gradients, which translate into large uncertainties in regional flux estimates from atmospheric inversions. Measurements of ocean pCO2 have large uncertainties associated with the paucity of measurements relative to the regional and temporal variability, and the estimated fluxes, with our inability to accurately quantify gas exchange. Ocean inversions avoid uncertainties due to gas exchange but have uncertainties associated with their estimated ocean transport and data fields. Ocean inversions estimate regional CO2 flux from measurements of DIC, O2, alkalinity, and nutrients. Ocean models generally agree globally with one another but show differences in regional uptake by up to 100 percent of the mean flux (Orr et al. 2001). In spite of these uncertainties, all the methods show an outgassing of CO2 in the tropics and an uptake at mid and high latitudes (Colorplate 9), consistent with our understanding of the underlying processes (Figure 12.1). The largest disagreement between the various estimates is in the Southern Ocean, where observations are sparser (Colorplate 9). Since the first report of the Intergovernmental Panel on Climate Change in 1990, scientists' confidence in an ocean uptake of ~2 PgC y-1 has increased tremendously. Early estimates, based on model results only, are now supported by a wide range of observations. The accuracy of this estimate, however, is hard to constrain. Estimates based on atmospheric measurements are hampered by the need to accurately quantify processes neglected so far (i.e., variations in land 813C fractionation, ocean O2/N2 outgassing); estimates based on ocean measurements, by the large spatial and temporal sampling frequency required; and ocean inversions and models, by the need to accurately quantify vertical transport and mixing processes in the ocean. On the other hand, it is possible to greatly reduce the uncertainty in regional flux estimates and in the global trend. Better constraints on regional ocean fluxes could substantially improve atmospheric inversions. The Southern Ocean is the worst-constrained region. The ocean south of 46°S covers 16 percent of the world oceans and ventilates about half of the deep ocean waters. Regional measurements suggest that this region is a sink of up to 1 PgC y-1 (Takahashi et al. 2002), but atmospheric inversions see a sink of only 0.4 PgC y-1 (Gurney et al. 2002). The discrepancies between the two methods maybe due to the absence of local measurements during winter (Metzl etal. 1999, 2001; Figure 12.2), but this remains to be shown at the scale of the entire basin. The future response of Southern Ocean CO2 uptake is one of the largest sources of uncertainty for predictions of future atmospheric CO2 (Friedlingstein, Chapter 10, this volume). Most of the uncertainties cited here apply to the mean state only. The difference between the 1980s and the 1990s appears to be more robust than the mean estimate for either decade (Le Quere et al. 2003). Monitoring stations (HOT, BATS) (Winn et al. 1999; Bates et al. 2002) and repeated surveys (Inoue et al. 1995; Feely et al. 2002) have measured changes in CO2 or DIC over the past decades thanks to the highly instrumental precisions and DIC standards (Dickson 2001). To understand and predict these trends, it is important to untangle variations in the processes that drive them, especially trends in ocean circulation and mixing, which have already been shown to affect DIC (Bates et al. 2002). For this we need large-scale monitoring of changes in ocean circulation and mixing and their effect on ocean biogeochemistry. The launching of drifting ARGO floats in the ocean will provide outstanding continuous measurements of temperature and salinity over the ocean. The attachment of O2 sensors to these floats would provide extremely valuable information on changes in ocean biogeochemistry. Scientists' understanding of the interactions between marine biology, biogeochem-istry, and physics needs improvement. This inadequacy is best illustrated by the fact that we cannot explain what caused the variations of 80 parts per million (ppm) in atmospheric CO2 during glaciations, although it is certain that the cause lies in ocean bio-geochemistry (Joos and Prentice, Chapter 7, this volume). This problem must be tackled with well-validated ocean biogeochemistry models. Yet current models barely take into account ecosystem dynamics and the role of different plankton functional types. Gaps in experts' understanding of vertical mixing hinder development of models of whole biogeochemical cycles. Examination of observed interannual to decadal variations of the surface and intermediate carbon cycle is also an important task for detecting and understanding trends or shifts and for verifying how present models are able to reproduce those variations. This examination can be achieved only if long-term time-series stations, surface underway measurements, and basin-scale sections are maintained for both dynamics and biogeochemistry in different ocean sectors and if data delivery and synthesis of observations occur at an international level. Until such models can be shown to reproduce glacial-interglacial variations in atmospheric CO2 and modern trends in biogeochemistry, our confidence in CO2 flux predictions will be limited. We thank J. Greenblatt for providing Table 12.1; N. Gruber, C. Sabine, J. L. Sarmiento, and two anonymous reviewers for constructive comments; people working for the SeaWiFS Project (NASA Code 970.2) for providing data for Figure 12.1; people working on board the R. V Marion-Dufresne for providing data for Figure 12.2 (OISO project supported by the French Institut National des Sciences de l'Univers, Institut Pierre-Simon Laplace, and Institut Polaire Paul-Emile Victor); R. M. Key for compiling global estimates of anthropogenic DIC for Figure 12.3; and M. Gloor for providing Colorplate 9. Archer, D., H. Kheshgi, and E. Maier-Reimer. 1997. Multiple timescales for neutralization of fossil fuel CO2. Geophysical Research Letters 24 (4): 405-408. Bates, N. R., A. C. Pequignet, R. J. Johnson, and N. Gruber. 2002. A short-term sink for atmospheric CO2 in subtropical mode water of the North Atlantic Ocean. Nature 420:489-493. Battle, M., M. Bender, T. Sowers, P. P Tans, J. H. Butler, J. W. Elkins, J. T. Ellis, T. Conway, N. Zhang, P. Lang, and A. D. Clarke. 1996. Atmospheric gas concentrations over the past century measured in air from firn at the South Pole. Nature 283:231 -235. Battle, M., M. Bender, P. P Tans, J. W. C. White, J. T. Ellis, T. Conway, and R. J. Francey. 2000. Global carbon sinks and their variability, inferred from atmospheric O2 and S13C. Science 287:2467-2470. Beaugrand, G, P C. Reid, F. Ibanez, J. A. Lindley, and M. Edwards. 2002. Reorganisation of North Atlantic marine copepod biodiversity and climate. Science 296:1692-1694. Behrenfeld, M. J., and P G. Falkowski. 1997. A consumer's guide to phytoplankton primary productivity models. Limnology and Oceanography 42:1479-1491. Bopp, L., P. Monfray, O. Aumont, J.-L. Dufresne, H. LeTreut, G. Madec, L. Terray, and J. Orr. 2001. Potential impact of climate change on marine export production. Global Biogeochemical Cycles 15:81-99. Bopp, L., C. Le Quere, M. Heimann, A. C. Manning, and P. Monfray. 2002. Climate-induced oxygen oceanic fluxes: Implications for the contemporary carbon budget. Global Biogeochemical Cycles 16, doi:10.1029/2001GB001445. Boyd, P W., and S. C. Doney. 2002. Modelling regional responses by marine pelagic ecosystems to global climate change. Geophysical Research Letters 29, doi:10.1029/2001GL0l4l30. Chavez, F. 1!, J. R. Ryan, S. E. Lluch-Cota, and M. Niquen. 2003. From anchovies to sardines and back: Multidecadal change in the Pacific Ocean. Science 2999:217-221. Ciais, P., P Tans, J. W. White, M. Trolier, R. Francey, J. Berry, D. Randall, P Sellers, J. Collatz and D. Schimel. 1995. Partitioning of ocean and land uptake of CO2 as inferred by S13C measurements from the NOAA Climate Monitoring and Diagnostics Laboratory Global Air Sampling Network. Journal of Geophysical Research 100:50515070. Dickson, A. 2001. Reference materials for oceanic measurements. Oceanography 14 (4): 21-22. Feely, R., J. Boutin, C. Cosca, Y. Dandonneau, J. Etcheto, H. Inoue,M. Ishii, C. Le Quere, D. Mackey, M. McPhaden, N. Metzl, A. Poisson, and R. Wanninkhov. 2002. Seasonal and interannual variability of CO2 in the Equatorial Pacific. Deep Sea Research 49:2443-2469. Gloor, M., N. Gruber, J. L. Sarmiento, C. L. Sabine, R. Feely, and C. Redenbeck. 2003. A first estimate of present and pre-industrial air-sea CO2 flux patterns based on ocean interior carbon measurements and models. Geophysical Research Letters 30 (1), doi:10.1029/2002GL015594. Gruber, N., and C. D. Keeling. 2001. An improved estimate of the isotopic air-sea disequilibrium of CO2: Implications for the oceanic uptake of anthropogenic CO2. Geophysical Research Letters 28:555-558. Gurney, K. R., R. M. Law, A. S. Denning, P. J. Rayner, D. Baker, P. Bousquet, L. Bruhwiler, Y.-H. Chen, P Ciais, S. Fan, I. Y. Fung, M. Gloor, M. Heimann, K. Higuchi, J. John, T. Maki, S. Maksyutov, K. Masarie, P. Peylin, M. Prather, B. C. Pak, J. Randerson, J. Sarmiento, S. Taguchi, T. Takahashi, and C.-W. Yuen. 2002. Towards robust regional estimates of CO2 sources and sinks using atmospheric transport models. Nature 415:626-630. Heimann, M., and E. Maier-Reimer. 1996. On the relations between the oceanic uptake of CO2 and its carbon isotopes. Global Biogeochemical Cycles 10:89-110. House, I. J., I. C. Prentice, and C. Le Quere. 2002. Maximum impacts of future reforestation or deforestation on atmospheric CO2. Global Change Biology 8:1-6. Inoue, H. Y., H. Matsueda, H. Ishii, K. Fushimi, M. Hirota, I. Asanuma, and Y. Takasugi. 1995. Long-term trend of the partial pressure of carbon dioxide (pCO2) in surface waters of thewestern North Pacific, 1984-1993. Tellus 47B:391-413. Karl, D. M., R. Letelier, L. Lupas, J. Dore, J. Chrisitan, and D. Hebel. 1999. The role of nitrogen fixation in biogeochemical cycling in the subtropical North Pacific Ocean. Nature 388:533-538. Keeling, R. F., and H. E. Garcia. 2002. The change in oceanic O2 inventory associated with recent global warming. Proceedings of the Natural Academy of Sciences 99:78487853. Keeling, C. D., and S. C. Piper. 2000. Interannual variations of exchanges of atmospheric CO2 and 13CO2 with the terrestrial biosphere and oceans from 1978 to 2000. III. Simulated sources and sinks. Scripps Institution of Oceanography Reference No. 00-14. San Diego: University of California, Scripps Institution of Oceanography. Laws, E. A., P G. Falkowski, W. O. Smith Jr., H. Ducklow, and J. J. McCarthy. 2000. Temperature effects on export production in the open ocean. Global Biogeochemical Cycles 14:1231-1246. Lee, K., S.-D. Choi, G.-H. Park, R. Wanninkhof, T.-H. Peng, R. M. Key, C. L. Sabine, R. A. Feely, J. L. Bullister, and F. J. Millero. 2003. An updated anthropogenic CO2 inventory in the Atlantic Ocean. Global Biogeochemical Cycles (submitted). Le Quere, C., O. Aumont, L. Bopp, P. Bousquet, P. Ciais, R. Francey, M. Heimann, C. D. Keeling, R. F. Keeling, H. Kheshgi, P. Peylin, S. C. Piper, I. C. Prentice, and P. J. Rayner. 2003. Two decades of ocean CO2 sink and variability. Tellus 55:649-656. Levitus S., J. I. Antonov, T. P. Boyer, and C. Stephens. 2000. Warming of the world ocean. Science 287:2225-2229. Levitus S., J. I. Antonov, J. Wang, T. L. Delworth, K. W. Dixon, and A. J. Broccoli. 2001. Anthropogenic warming of Earth's climate system. Science 292:267-270. McNeil, B. I., R. J. Matear, R. M. Key, J. L. Bullister, and J. L. Sarmiento. 2003. Anthropogenic CO2 uptake by the ocean based on the global chlorofluorocarbon data set. Nature 299:235-239. Metzl, N., B. Tilbrook, and A. Poisson. 1999. The annual fCO2 cycle and the air-sea CO2 flux in the sub-Antarctic Ocean. Tellus 51B (4): 849-861. Metzl, N., C. Brunet, A. Jabaud-Jan, A. Poisson, and B. Schauer. 2001. Summer and winter air-sea CO2fluxes in the Southern Ocean. Pp. 685-688 in Proceedings of the 6th International Carbon Dioxide Conference, Vol. 2. Tsukuba, Japan: Center for Global Environmental Research. Murnane, R., J. L. Sarmiento, and C. Le Quere. 1999. Spatial distribution of air-sea CO2 fluxes and the interhemispheric transport of carbon by the oceans. Global Biogeochemical Cycles 13:287-305. Orr, J. C., E. Maier-Reimer, U. Mikolajewicz, P. Monfray, J. L. Sarmiento, J. R. Toggweiler, N. K. Taylor, J. Palmer, N. Gruber, C. L. Sabine, C. Le Quere, R. M. Key, and J. Boutin. 2001. Estimates of anthropogenic carbon uptake from four three-dimensional global ocean models. Global Biogeochemical Cycles 15:43-60. Plattner, G.-K., F. Joos, and T. F. Stocker. 2002. Revision of the global carbon budget due to changing air-sea oxygen fluxes. Global Biogeochemical Cycles, doi:10.1029/2001GB001746. Prentice, I. C., G. D. Farquhar, M. J. R. Fasham, M. L. Goulden, M. Heimann, and V. J. Jaramillo, H. S. Kheshgi, C. Le Quere, R. J. Scholes, and D. W. R. Wallace. 2001. The carbon cycle and atmospheric CO2. Pp. 183-237 in Climate change 2001: The scientific basis (Contribution of Working Group I to the third assessment report of the Intergovernmental Panel on Climate Change), edited by J. T. Houghton, Y. Ding, D. J. Griggs, M. Noguer, P. J. van der Linden, X. Dai, K. Maskell, and C. A. Johnson. Cambridge: Cambridge University Press. Quay, P. D., B. Tilbrook, and C. S. Wong. 1992. Oceanic uptake of fossil fuel CO2: Car-bon-13 evidence. Science 256:74-79. Sabine, C., L., R. M. Key, K. M. Johnson, F. J. Millero, J. L. Sarmiento, D. W. R.
Wallace, and C. D. Winn. 1999. Anthropogenic CO2 inventory of the Indian ocean. GlobalBiogeochemical Cycles 13:179—198. Sabine, C. L., R. A. Feely, R. M. Key, J. L. Bullister, F. J. Millero, K. Lee, T.-H. Peng, B. Tilbrook, T. Ono, and C. S. Wong. 2002. Distribution of anthropogenic CO2 in the Pacific Ocean. Global Biogeochemical Cycles, doi:10.1029/2001GB001639. Takahashi, T., S. C. Sutherland, C. Sweeney, A. Poisson, N. Metzl, B. Tilbrook, N. Bates, R. Wanninkhof, R. A. Feely, C. Sabine, J. Olafsson, and Y. Nojiri. 2002. Global sea-air CO2flux based on climatological surface ocean pCO2, and seasonal biological and temperature effects. Deep Sea Research II 49:1601-1622. Tans, P. P., T. J. Conway, and T. Nakazawa. 1989. Latitudinal distribution of the sources and sinks of atmospheric carbon dioxide derived from surface observations and atmospheric transport model. Journal of Geophysical Research 94:5151-5172. Trolier, M., J. W. C. White, P P. Tans, K. A. Masarie, and P A. Gemery. 1996. Monitoring the isotopic composition of atmospheric CO2-measurements from the NOAA Global Air Sampling Network. Journal of Geophysical Research 101:25897-25916. Wanninkhof, R. S., S. Doney, T. Takahashi, and W. McGillis. 2001. The effect of using averaged winds on global air-sea CO2 fluxes. Pp. 351 -356 in Gas transfer at water surfaces, edited by M. A. Donelan, W. M. Drennan, E. S. Saltzman, and R. Wanninkhof. AGU Geophysical Monograph Series Vol. 127. Washington, DC: AGU Press. Winn, C. D., Y.-H. Li, F. T. Mackenzie, and D. M. Karl. 1999. Rising surface ocean dissolved inorganic carbon at the Hawaii ocean time-series site. Marine Chemistry 60:33-47.